The Unfinished. Asus' multimedia-office newcomer compels with its elegant design and a particularly light and compact case, but can hardly keep up in the gaming arena with its GeForce 940MX. Despite many good attributes, we cannot give a purchase recommendation to the device, which is not just due to the modest battery life. The Asus VivoBook S15 S510UQ is not a perfect laptop. Its build could be better, the screen brighter and battery life longer. Positive: Good price; impressive design; fast fingerprint sensor; nice performance; good cooling system. The Asus VivoBook S15 S510UN is pretty laptop designed for ‘everyday’ users with 8th generation Core i processor. Its NanoEdge display ensures a small footprint. Does the slim profile have an impact on performance, thermal management, battery life, and performance? 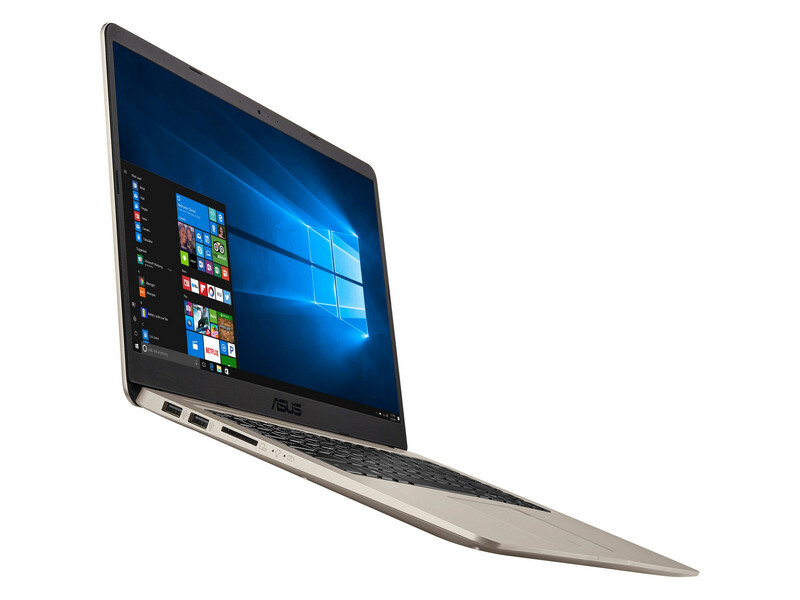 The Asus VivoBook S15 S510UN features a 15.6-inch display in 14-inch case. Thanks to its advanced three-sided NanoEdge display, the screen-to-body ratio is 86 % according to Asus. There are a couple of color variants, which are Icicle Gold, Gun Metal, Silver Blue, Star Grey, and Firmament Green. The laptop features a brushed metal look without the concentric circle design seen on earlier Asus laptops. With a weight of 1.7 kg it is lighter than many of its competitors. The display lid is made of aluminum and the base unit is made of plastic. www.digit.in complains that the laptop is susceptible to noticeable flex. For beebom.com Asus seems to have done a wonderful job in combining exquisite looks with near-perfect ergonomics, but the plastic build is sort of disappointing. In contrast to www.digit.in, they speak of a “very minimal flex”. geeksnipper.com reports that the laptop isn’t openable with one hand. You can easily take off the underside after removing 10 Philips head screws. Hence, it is easy to replace RAM modules (two RAM slots), HDD drive, and the M.2 SSD storage if required. The laptop comes with a total of four USB ports. Two of them are only USB 2.0 Type-A ports, the other two are USB-3.0 Type-C and USB-3.0 Type-A. External displays can be connected via HDMI. In addition, you will get a microSD card slot and a microphone/headphone jack combo. The laptop lacks an optical drive. It uses a proprietary power connector instead of USB-C charging. An Ethernet port or a USB adapter for it are not included. You can connect to networks via dual-band 802.11ac Wi-Fi with advanced Wi-Fi Master technology. Bluetooth V4.2 is supported. A fingerprint scanner sits at the right-hand corner of the touchpad. It supports Windows Hello. According to www.digit.in it works as intended, is easy to setup and quite reliable. According to www.digit.in the flex on the keyboard deck hampers the typing experience. Asus specifies a key travel of 1.4 mm key. www.gadgetsnow.com complains that the short key travel failed to give them a confident stroke. Due to the small footprint, Asus has omitted a numpad. The home, end, pg up and pg dn keys are in an extra column on the right of the keyboard. Hence, you might need some time getting used to the slightly altered layout. Hardik Singh from www.digit.in would have preferred full-sized left and right arrow keys. He says that the typing experience is average due to lack of consistent feedback between different keys. In contrast, the “typing on this keyboard is a breeze” for beebom.com. They only complain that there is no LED notification on the Caps Lock button. The keyboard’s a two-stage white backlighting can be helpful when typing in dim environments. The Elan touchpad has a plastic surface. www.digit.in reports that the swipes are not perfectly precise and all Windows-based gestures will require some practice. According to them the two integrated left and right click buttons work well, have a short click and offer an audible feedback. According to www.gadgetsnow.com the touchpad is spacious. Nevertheless they had enough area to rest their palms while typing and there were no accidental clicks from the touchpad while doing so. beebom.com thinks that the VivoBook is one of those laptops that features a touchpad as good as the Macbooks out there. 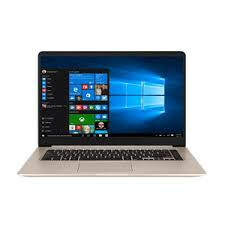 Asus specifies that the Asus VivoBook S15 S510UN comes with a matte 15.6” LED-backlit Full HD display with 16:9 aspect ratio and Full HD resolution (1,920 x 1,080 pixels) and 178° wide-view technology. The ASUS Eye Care technology reduces blue-light by up to 30 %. Thanks to the IPS technology the viewing angles are good. www.digit.in measured a maximum brightness of 252 cd/m² at the center of the display, which is about average. They report that the brightness levels are pretty consistent throughout the display, but criticize that the colors are not suited for users requiring high color accuracy. In contrast, the reviewer from www.beebom.com writes, “It is one of the most color accurate displays I’ve ever tested, offering a 100% sRGB”. geeksnipper.com says that it is a 45% NTSC IPS panel and so, it is not great for content creation, but a nice display for productivity & lightweight gaming. 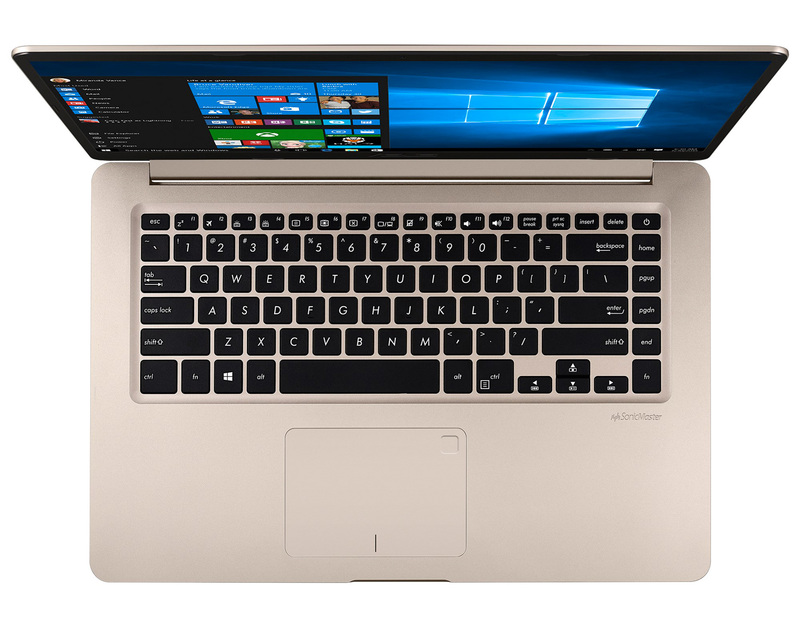 The Asus VivoBook S15 S510UN features an 8th generation (Kaby Lake) Core i processor from Intel. Asus lists the following processor options on its homepage: Intel Core i7-8550U, Core i5-8250U, and Core i3-8130U. An Nvidia GeForce MX150 with 2 GB RAM is responsible for graphics rendering. The dedicated entry-level mobile graphics card based on the GP108 chip with the Pascal architecture is suitable for light gaming. Depending on the variant, the laptop comes with 4 GB up to 16 GB of 2,400 MHz DDR4 RAM. It uses a dual storage solution consisting of either a 512 GB, 256 GB, or 128 GB SATA SSD and either a 2 TB, 1 TB, or 500 GB HDD. www.digit.in have tested a model with Intel Core i7-8550U CPU, 16 GB RAM and 128 GB SSD by Toshiba. They report that the laptop achieved more than 60 fps in games like Dota 2 at full settings and easily averaged around 82 fps in older titles such as Bioshock Infinite. These results are in line with Notebookcheck’s benchmark results for this graphics card. www.gadgetsnow.com got 10218 and P4 397 scores in PC Mark and 3D Mark, respectively, from the i7 8550U variant. beebom.com has also tested the i7 variant with 16 GB of RAM and a 128 GB SSD and got a constant 110 FPS on Counter-Strike: Global Offensive, and a 42 FPS on an unoptimized game as PlayerUnknown’s Battlegrounds. geeksnipper.com had no issues with day to day usage for productivity. They say their test system (Core i7-8550U CPU, 16 GB RAM) felt snappy and responsive. www.digit.in reports that their test model (Core i7-8550U CPU) stays comfortably cool on low to medium loads, but the temperature on the base of the machine rises to near 50-degree Celsius beyond that. They complain, “While the heat is mainly concentrated on the top portion and the base of the unit, one can feel the heat between keys on top rows”. www.gadgetsnow.com praises that Asus’ IceCool technology keeps the average palm rest temperatures under 35-degrees. beebom.com never faced any thermal issues. According to www.digit.in the two bottom firing speakers are not extremely loud and distortion in some mid and bass heavy tracks is audible beyond 75 % volume. www.gadgetsnow.com finds the stereo audio quality impressive, as Asus’ SonicMaster audio technology filters noise and delivers clear audio with deeper bass. In contrast, beebom.com thinks that not only the placement of the speakers at the bottom of the laptop is bad, but the sound is mediocre at best. geeksnipper.com summarizes, “The speakers are not as good as like something on the ROG GL553 but, they are better than many of the Ultrabook & 2-in-1 Laptop speakers that, I’ve heard recently”. The Asus VivoBook S15 S510UN features a 42 Wh 3-cell lithium prismatic battery, which supports fast charging to 60 % in 49 minutes according to the Asus. According to www.digit.in, the battery life of 4-5 hours with light to medium use and brightness at 75 % is quite low in comparison to the 6-7 hours of their category average among mainstream laptops. In contrast, www.gadgetsnow.com praises the battery life and reports over 6 hours on regular use and 3-4 hours on heavy use. beebom.com managed to to push their test device to 6 hours with their average performance without putting the device on the battery saving mode. geeksnipper.com got around 6 hours with regular kind of stuff like web browsing, taking notes, watching videos etc. The press praises the Asus S510UN for its good display and performance. While the battery life appears low and typing experience unsatisfying to www.digit.in, beebom.com only complains about audio quality. geeksnipper.com wished for a higher display brightness. Moreover, they did not like that the 480P webcam is unusable for video calls most of the time and the USB Type-C Port does not support Thunderbolt 3. 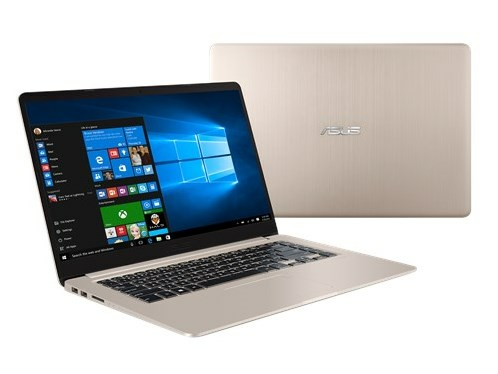 As of July 2018, the Asus S510UN-BQD39T VivoBook S15 (Core i7, 8 GB RAM, NVIDIA GeForce MX150, 256 GB SSD + 1 TB HDD) costs about 1,100 Euros on www.amazon.de. The S510UN-EH76 costs (same specification) about 890 US dollar on www.amazon.com. Alternatives include the Acer Nitro 5, the Acer Aspire E 15 E5-575G-57D4, the HP Envy x360 m6, and the Dell Inspiron 15 5000. www.digit.in suggest considering an entry-level gaming machine instead if performance is important for you. They recommend to also check out older models of the Dell Inspiron 7000 or the Lenovo Ideapad 520s series if performance is not your main priority. geeksnipper.com summarizes, “If you want a laptop mainly for regular productivity stuff & lightweight gaming, this is a really nice option”. The Asus Vivobook S15 seems like a half-hearted attempt at making a mainstream laptop that is thin and light and packs-in the latest hardware. While it offers impressive specifications it does disappoint on a few (but critical) basics. All-in-all, VivoBook S15 for us has might just be a new benchmark in the 'everyday use' laptop category with some of the newest set of specs, pleasing design, and an aggressive price tag. NVIDIA GeForce 940MX: Mid-range laptop graphics card based on the Maxwell architecture. Compared to the older 940M, the MX now also supports GDDR5 graphics memory and maybe slightly faster clock speeds.NVIDIA GeForce MX150: Pascal GP108 based laptop graphics card and mobile version of the desktop GeForce GT 1030. Offers 384 shader cores and usually 2 GB GDDR5 with a 64 Bit memory bus. Manufactured in 14nm.» Further information can be found in our Comparison of Mobile Graphics Cards and the corresponding Benchmark List. 74.4%: This rating is bad. Most notebooks are better rated. This is not a recommendation for purchase.» Further information can be found in our Notebook Purchase Guide.